Wholesale Custom 20 oz. Coffee Mugs and Personalized 16 Oz. Latte Cups. Inexpensive, Promotional. Budget Prices for USA, Canada. Wholesale personalized 20 oz. Coffee Mugs, and 16 Oz. 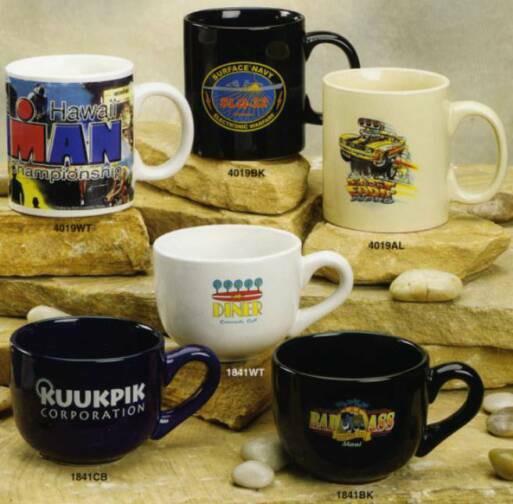 latte mugs, custom imprinted with your logo. We also supply bulk blank (not custom imprinted) mugs at EQP (End Quantity Pricing). Budget Prices in the USA and Canada for wholesale custom printed 20 oz. mugs and latte mugs. Free artwork design. US clients pay no taxes. We will send you a proof for your approval before production. Please see the Price Table below the picture. Metallic Gold or Metallic Platinum imprint: extra $0.40 per side. Shipping from California, Florida or Pennsylvania (your choice). Please multiply all the above US prices by 1.30 to calculate CDN$ prices. Prices include your 1-color custom imprint.